It’s been out for a while now, and it’s already become a massive success in the process. And so with all the hype Pokemon GO has been getting, I thought it’d be time to finally review the game as a whole. Does it really live up to the idea of real life Pokemon collecting and battling? Does it do a good job of transferring the Pokemon feel to the mobile app world? Well, sort of. It’s fun, and it’s certainly a nice way to get people exploring the world around them. But what’s it like on a more detailed level? Well, let’s find out, in our official Gaming Reinvented review of Pokemon GO! First on the agenda, let’s talk Pokemon GO’s graphics. Which for the most part, are actually pretty good. For example, the Pokemon models have been designed pretty neatly here. Sure, they’re not Pokken Tournament or Super Smash Bros quality, but they do at least look a bit like what you’d see in one of the Gamecube era spinoffs. And the menus and interface are a decent quality too. Yeah, they’ve got the same ‘flat’ look present in a lot of mobile games and modern websites. That’s pretty much undeniable. But it does work well, and it makes finding nearby Pokemon, gym and Pokestops really convenient. Above: They need to add these in. Via Magdalena Proszowska. So on a graphical level, Pokemon GO works well. But how about the sound? Yes, it’s not the best in the series. There’s nothing in Pokemon GO that can quite match some of the songs from generation 5 or generation 6, because it’s a simple ‘collect them all’ experience without anything in the way of special boss battles or a main plotline. But it works well for what it is, and you won’t ever really find any of the music irritating here. But the aesthetics don’t mean anything without the gameplay to back it up. And suffice to say, Pokemon GO’s gameplay is pretty good for the most part. 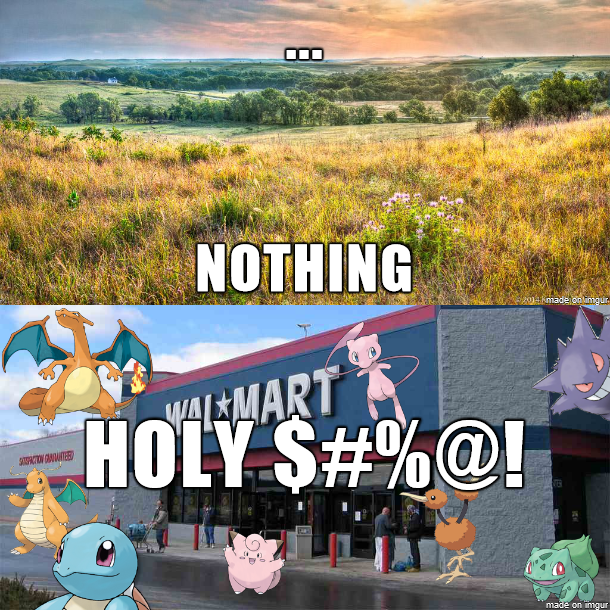 Now, before we start, I have to mention that Pokemon GO is not a typical Pokemon experience. You don’t fight Pokemon directly to weak them. You don’t go around collecting badges from different gyms and battling the regional league and elite four. There are no gimmicky extras like the contests and studios and musicals or whatever else. Heck, you don’t even have the ability to trade or battle Pokemon with people nearby yet! But this doesn’t mean the game isn’t enjoyable. It’s just a very different beast from the games on Nintendo’s handheld systems. Either way, here’s how it works (in case you’ve been living under a rock for the last two weeks). You’ve got a map that corresponds to your location in the real world. When you walk, the GPS moves your character in game accordingly. As you move along, Pokemon will appear nearby on the map. By touching them, you’re then taken to Augmented Reality view based on the camera, where the Pokemon is shown in the corresponding area in the real world. At this point, you then have to chuck Poke Balls at them by flicking the screen towards the Pokemon, while trying to time it so the circles are smallest around said Pokemon. Do it successfully, and its caught. Do it unsuccessfully, it breaks out or the Poke Ball misses. You also have the gym and team systems. Basically, at level 5 you get invited to join one of three teams when you first challenge a gym. Once you’re a member, you then go around to other gyms and try to take control. 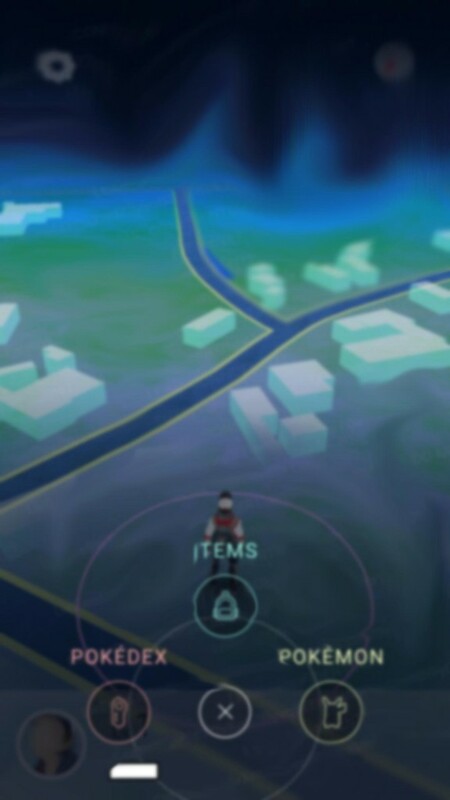 If it’s not controlled by anyone (the map icon is white), you can just leave a Pokemon there to claim it. If it’s controlled by your team, you can either train with the Pokemon there or leave one of your own to fortify its defences. And if it’s controlled by an opponent, that’s when you can challenge the gym. This is when you select up to 6 Pokemon to take on the opponent Pokemon stationed at the gym. Beating all of them lowers the gym’s prestige, losing all your Pokemon raises it. If the prestige reaches 0, then the gym can be claimed by another team. Either way, this is where the battle system comes in. Unlike other games, you don’t have four special attacks and a bunch of different stats. Instead, you have one strong move and one weak move, and the only useful stats are HP and CP (Combat Power). You then either press the screen to use the weak attack, or hold it for a while to charge up the powerful one. Meanwhile, you can dodge moves by swiping on the touch screen when the opponent is trying to hit you. It’s a different system, and it’s pretty much an individual preference thing in regards to whether it works anywhere near as well as the traditional battle system. There’s also a progression system (now tied to the trainer), where levelling up gives you access to more Pokemon species to catch and better items to use. And you can also catch multiple Pokemon of the same species to earn Candy. This lets you level them up and evolve them, since traditional exp isn’t a thing in Pokemon GO. This is also where the ‘freemium’ aspect comes in. Buying certain items costs PokeCoins, an in game currency. You can get this by either defending gyms (every 21 hours), or buying them with real money. So in theory, you can buy a lot of Poke Balls, Incense, Lure Modules or other items by buying the coins and spending them in game. Unlike other mobile games though, you’re not forced to ever actually spend real money for anything. I mean, you could, sure. 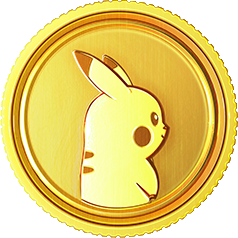 But you can always win more coins in game, and every trainer level reached gives you a lot of extra items as well. Seriously, you can easily get 30 extra Poke Balls on some level changes, so it’s quite possible to have enough to catch hundreds of Pokemon without ever spending a single penny or dime. Much better than the solution in games like Candy Crush, I must say! Either way, Pokemon GO has a surprising amount of depth for a spinoff and it’s very much an enjoyable game to play in its own right. For one thing, the popularity of games makes the servers very unstable. As a result, it’s possible to fail to log in multiple times or have the game crash when you’re in the middle of a Pokemon encounter or gym battle. Add how the game tends to kick you out whenever the internet connection fails, and you’ve got a game whose glitches can really hurt the experience. And it’s not the game’s only issue. It’s other one is Pokemon distribution. Because put simply, it’s really poor. If you’re in a city (especially a large one like New York or London), it’s great. Pokemon appear everywhere, you’re never too far from Pokestops to get resources from and hey, it apparently acts as a really nice way to socialise with people too. But if you’re in the country or a suburb, the game’s usefulness is far more limited. Few Pokemon appear (cause apparently the amount that show up depends on how many mobile signals are around) and things like Pokestops and gyms are basically non existent. This really takes away from the experience. Because you see, Pokemon was always about exploring the world and go to all kinds of exotic locations to find the rarest species. You’d go through fields and forests. Caves and across the ocean. Through old abandoned temples and factories and villain bases. And the further out you went, the better the Pokemon you usually encountered were. This gave you a reason to explore the distant corners of the world and experience interesting places. Here though? They’re all basically done at Walmart or Tesco. The tall grass lies empty, but the cities are now overflowing with species. And those event Pokemon? Oh, don’t bother trekking to an out of the way cave to find them. You won’t get Mewtwo in the Unknown Dungeon here. As a result, the value of Pokemon GO depends significantly on where you live. Are you an inhabitant of a large city like London or New York? Then good for you. If you live near the centre of town, you’ll have plenty of access to Pokemon, gyms and Pokestops. Do you live in the country side miles from civilisation? Then unfortunately the game will be nowhere near as fun for you. And this is a shame really. One of the best parts of the original games was that you were encouraged to explore far and wide. That wherever you went, there would be new and interesting Pokemon to find nearby. Heck, even the old anime theme song said it! You won’t be venturing far and wide to complete Pokemon GO. Either way, on a gameplay level, it’s a fun game. Just one whose enjoyability depends significantly on where you live. It’s Pokemon. Do you really think you’ll be able to get all 151 species (included so far) in just a couple of days? Or reach the highest level within a matter of hours? Pokemon GO provides weeks or months of replay value, and it’ll only get better when extra features or Pokemon are added in. In other words, replay value here is virtually infinite like in every other Pokemon game. Pokemon GO is a fun, if slightly simplified Pokemon game for smartphones. It’s got its issues (especially if you live out of town), but for the most part it’s a fun experience that will keep gamers happy for at least the next few months or so. Note: The review score is for people who live in or near a major city. If you don’t, remove one or two stars to get a better idea about how the game plays. Game avoids sleazy 'freemium' monetisation tactics. A fun Pokemon game for mobile devices, with a few technical issues left to sort out. and the Paper Jam article has so many videos it ends right at the conclusion (bug?). Yeah, review structure is something I'm thinking about a bit more. I tend to write a lot about every game, so I'll probably go back and cut off the reviews a bit earlier to avoid the page nearly crashing cause of the videos and pictures. Ratings for each category could work well. Pros/cons for each I'm not sure about. Seems like a lot of padding, especially when you don't really have enough to say to fill up such a section. What would you say a con would be in regards to say, Mario Galaxy's music?